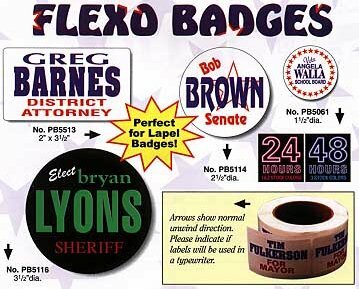 Lapel stickers come on rolls of 500 or 1,000 with your message on it. These lapel decal stickers are printed in Fire Red, Ultra Blue, Emerald Green, and/or Black on White Gloss or White Matte Paper. These are indoor stickers printed on paper with adhesive, not vinyl. The stickers are available in various shapes and sizes. Total production time approx. 1 week. An additional $20 non-refundable artwork charge must be paid before work can begin. Lapel Decal Stickers are for INDOOR use only. If you need these for outdoor use, please contact us for other options available. These are normally printed on white vinyl. Roll Labels can be Flexo printed on many different stocks, in several colors to choose from that will meet your label needs. Make your own design, create your design and will print your own customized design. Decal stickers are suitable for indoor and outdoor use. They are available in a large variety of stock sizes and materials. Choose from white vinyl or clear polyester. White vinyl is back adhesive only. Clear polyester is available as back adhesive or as face adhesive for inside window application. Remember: White is a color on clear material and is priced as an additional color. White is highly recommended to improve ink opacity and contrast. An artwork fee of $20 is due before artwork begins. Call today and let us help you get started on designing your decal sticker!